Yesterday, I made a day-trip to Bhopal with my rtCamp colleagues for first WordCamp Bhopal. 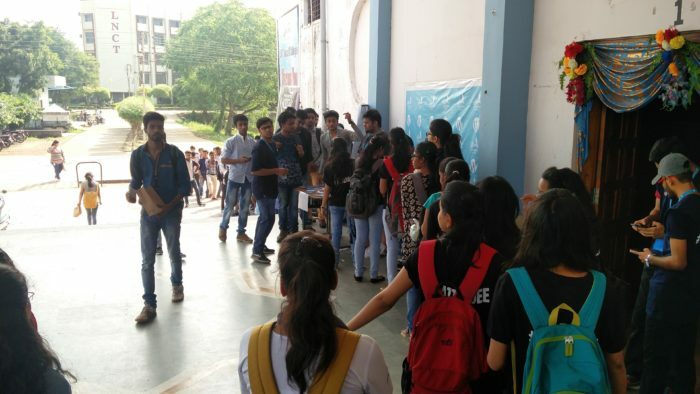 As WordCamp Bhopal was organized by students entirely, I was closely following it. Usually, WordCamp begins with registration. But this WordCamp for outstation guests started with getting ready at a guest house. A very well maintained, big and polished guest house, hardly 50 meters from the WordCamp venue, given free to the WordCamp by the venue sponsors! So many good things together. ? Below is a picture of its lobby taken by Saurabh. Like most WordCamps, this also has long registration queue. But it went smoother than expected, especially considering this was first WordCamp for many WordCamp organizers as well! ? Apart from looking at the registration queue, we enjoyed tea and sandwiches. Next was projector glitch. I have seen this at many WordCamps that I started to feel that no WordCamp can be complete without this! ? Luckily, Vachan managed to get the event started using a portable ZTE projector he was carrying! Hats off to Vachan! ? Can you imagine somebody carries a projector in his backup? ? The clear winner of the entire glitch was ZTE. They will get some new customers as many people liked the idea of carrying a portal projector same as Vachan. If anyone from ZTE is reading this, you should give Vachan free upgrade to next product. At least buy him few beers! ? There were amazing sessions by all speakers. Naming one is hard! As the event started late by almost 1 hour, all speakers were requested to cut down time and most obliged. The result was, the event finished on time, even after starting late. Below are slides from my session. My topic was similar to my WordCamp Singapore topic. The subtle change was the shift in focus from client-side to hiring-side. I feel, my session was not as relevant to most of the audience. I was not aware that almost 80% attendees would be students. Otherwise, I would have picked a different topic! I interacted a lot with the audience after my session. I had nice time answering their questions. I hope few people would start blogging after yesterday’s WordCamp. Below is a picture of the curious faces taken by Amit. You may notice a lot of empty seats in the back, but that was because the venue was too big. Its official capacity is close to 1500 attendees! I would like to thank and congratulate WordCamp Bhopal organizers for an amazing WordCamp they organized! ? I must thank LNCT college for being so generous with the WordPress community. Apart from the main auditorium, guest house, cars, and buses, they have also donated a permanent space in their campus for future WordPress meetups! And this is all free. ? Finally, Aditya Shah, the lead organizer gave me ride to the airport on his bike. Not only that, he showed me Bhopal on the way. 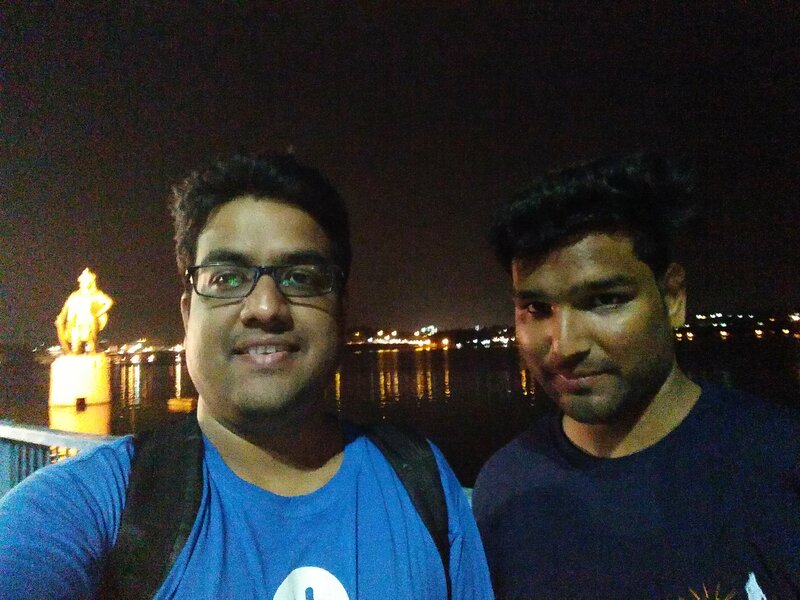 I had panipuri on the way, and we clicked a selfie with Raja Bhoj – the dude in the WordCamp Bhopal logo. Thanks Aditya for this nice ride and panipuri! ??? Hey, Thank you Rahul for the mention! Always a pleasure to help a fellow WordCamper.